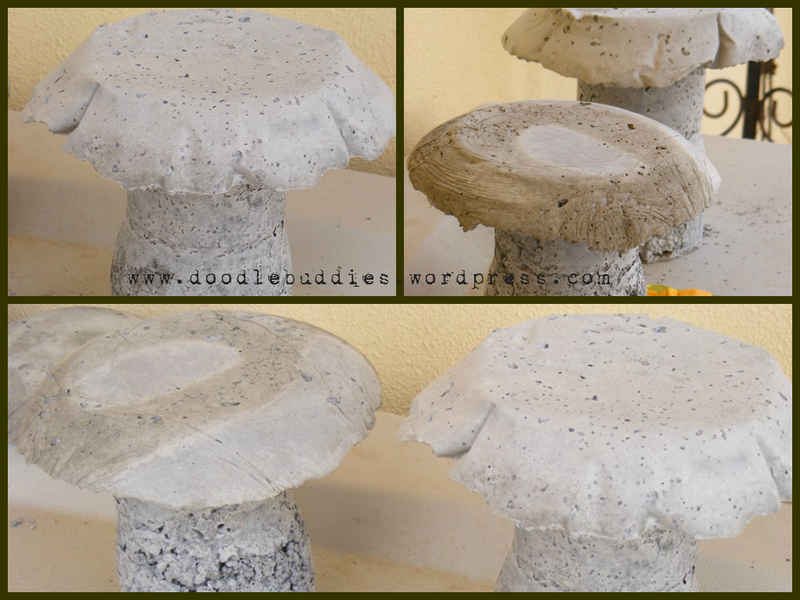 Concrete Mushrooms !! A tutorial. Keep all the utencils, spatula, bucket etc ready and on top of some plastic sheet. Gloves are a MUST !! You wouldn’t realize it until the next morning how worn and hurt your hands are going to be. Goof up 2. 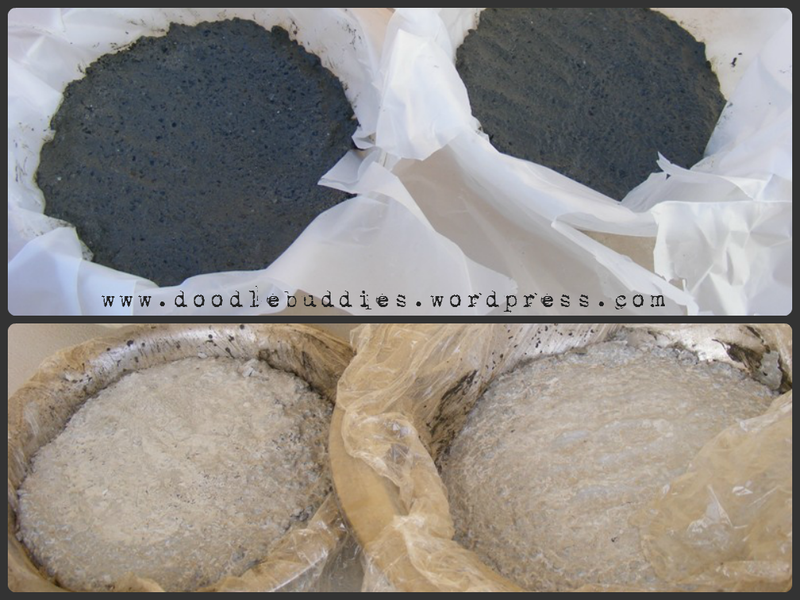 Since the idea is to give the shape (mold) of the utencil/container to the mixed cement, its best to have everything ready beforehand. Concrete clumps relatively quickly but takes a long period to set. Since we were working on it for the first time, we basically added the cement mix with some tiny gravel and alittle sand with some water. I just added the three and tested with the consistency of the water. Don’t mix with your hands, it will squeeze the muscles out of you ~ use a spatula in the bucket to stir the mix. 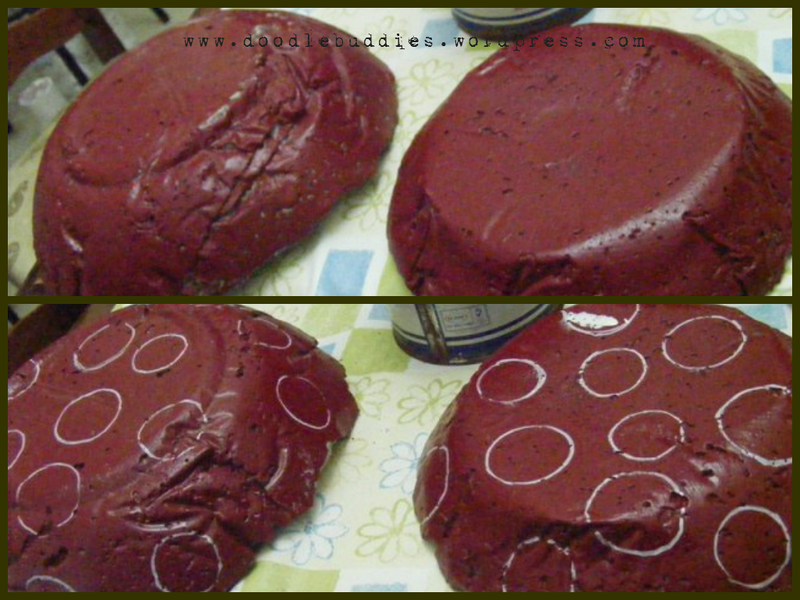 When I felt confident of the consistency, I placed some hard plastic sheet (u can also use some cling wrap) to a container and fill some of the mix in it. This is where, I wish I would have added some more water 😦 Goof up 3. Press and smooth the base of the mix with your spatula. This is the head of the mushroom ! 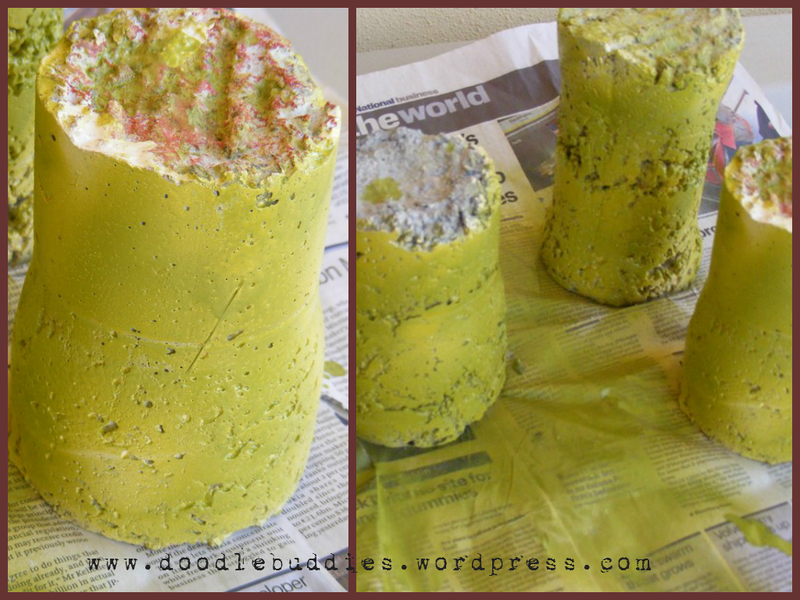 For the trunk or stem of the mushroom, I cut off both sides of a large 7UP bottle and filled it 3/4 of the cement mix. Leave the containers to strengthen for nearly 48 hours. The concrete leaves the container quite easily once it is set . It would be a good idea to use a little sanding paper to sand off some loose pieces from the edges. Using an xo knife, just cut open the side of the 7up bottle and voila !! It just falls in your hand like a large cylinder. One end is quite smooth and stable while the other end will be quite rough and rugged. The picture below is that of them both (mushroom umbrella and stem) meeting together for the first time. I wanted to see, which head sat on which trunk best for size, support and stability. 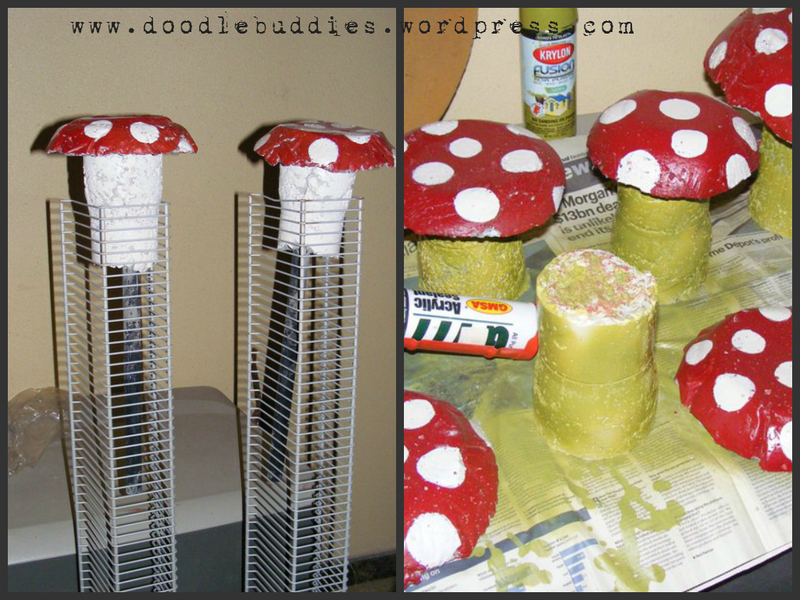 I decided to spray paint the mushrooms, green, that I’ll be keeping in the porch. Now, just a word of caution. Concrete does absorb aloooot of paint. SO for best results, if your going to spray paint, 2 coats will do the job well. Still, I believe, spray paint is not the best choice for concrete. For the umbrella, my wingman sawaab, used some glossy bright red paint and painted the town red 😉 Once the paint had dried, we had different size circles drawn on them and filled it with white acrylic paint. Once that was done, a single of coat of modge podge to seal the deal 🙂 Very few glues can join two pieces of concrete except the silicone guns. 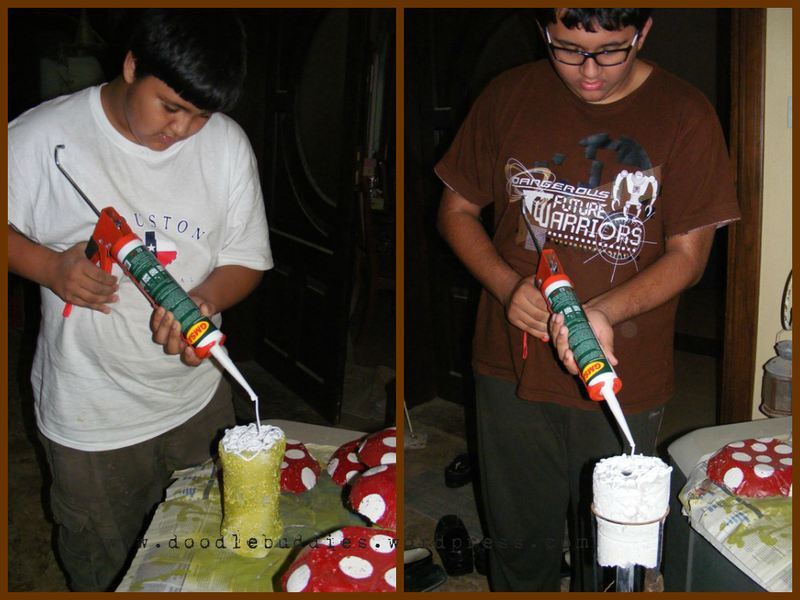 So here my wingmen are using a lot of force and fun to fill the stem of the mushrooms with some silicone glue. Arent the colors such a delight !!! The two mushroom stems in the next photo shows two pvc tubes running into them. 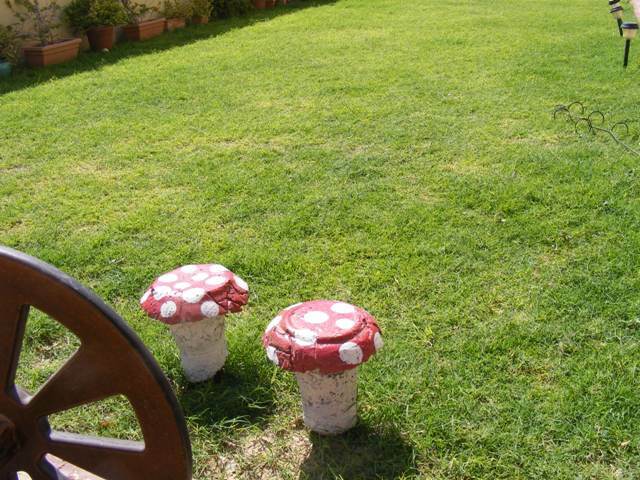 This was done in the mixing stage so that both these mushrooms could get some support when dug into the grass. 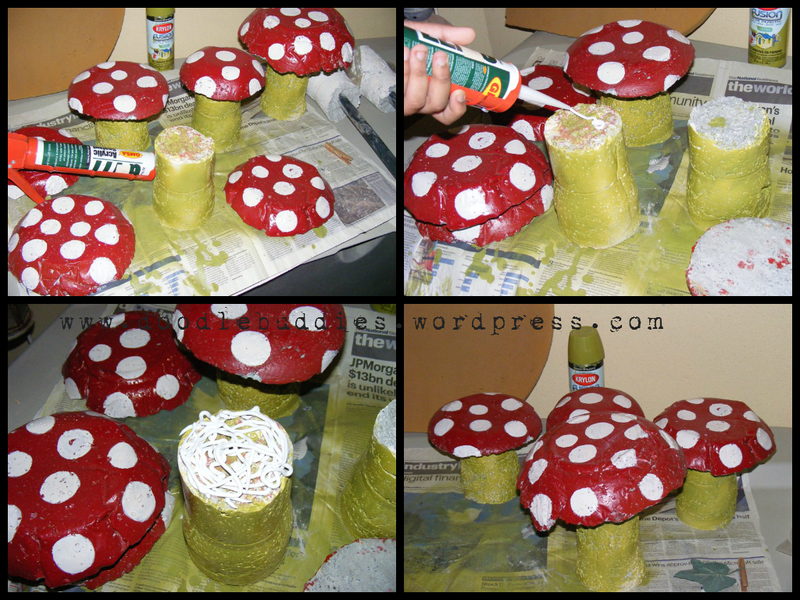 We didn’t want the mushrooms tilting or falling off, every time a ball hit them. Only these two were painted white unlike the other green ones. And there you have it !! 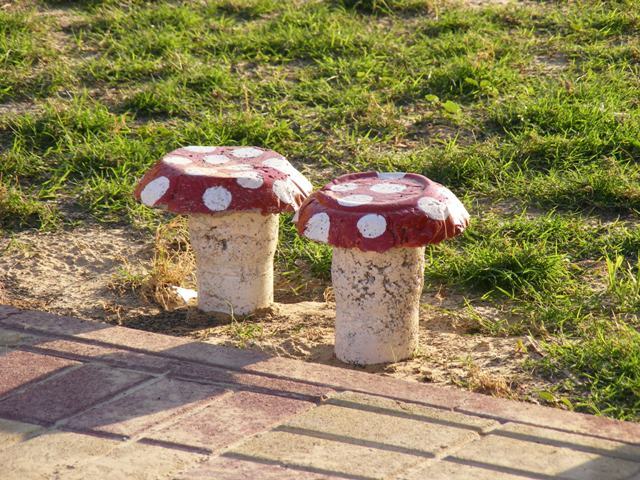 Two little happy mushrooms enjoying the sunshine together 🙂 Notice how firmly they stand due to the pvc poles holding them deep into the ground. We kept the stems white so as to stand out in the beautiful green grass. All said and done, I feel, the imperfections added character to these little sculptures. Some were great while some were a learning experience 🙂 I enjoyed coming out of my comfort zone and trying something unique and new. As much as I realized the endless possibilities of sculpting with concrete, I am beginning to understand its limitations too. 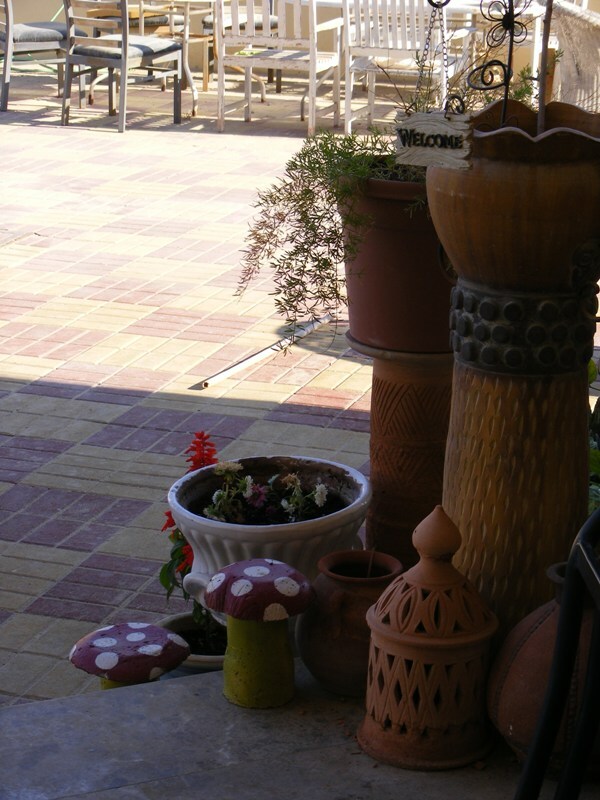 All four of these mushrooms adorn my porch and welcome all my guests. Its purely a labor of love !! 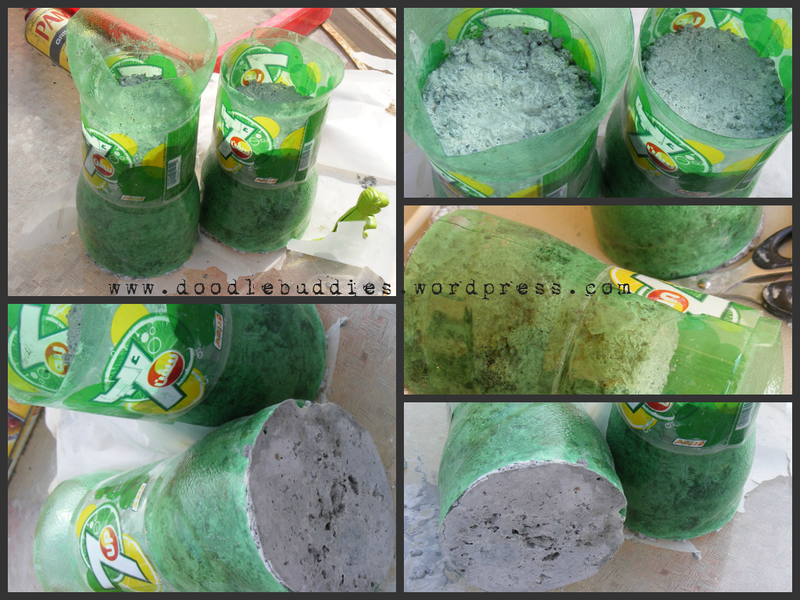 Recyled materials :- 7UP bottle, spatula, plastic sheets used by the movers when we shifted here, pvc pipes from other projects. Show off weekend blog party @ A peek into my paradise. Thank you for visiting me today friends. I hope you found this post entertaining and informative. Please leave a comment or subscribe to my posts and stay updated with my latest posts. Have a beautiful day ! Previous postRipe Market at Safa Park. 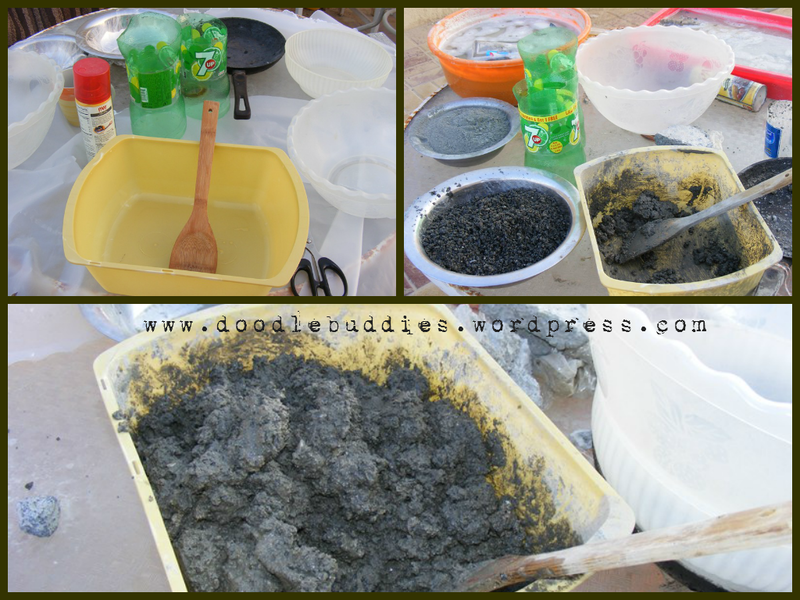 Next postWhere do you buy craft supplies from, in Dubai ? They are absolutely beautiful. 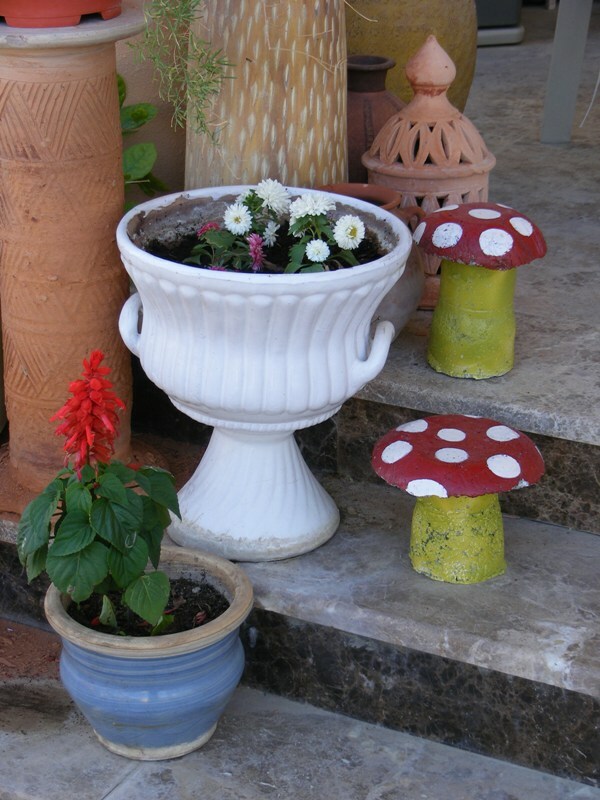 I was just reading about making globes from cement but I never thought to make mushrooms. We live in Connecticut and we have so much so snow still that it is hard to think about anything outside. I will be trying something as soon as I can go out without freezing. Hi Patty !! Thank you for your lovely comment ! Snow is something we dream about !!! But I suppose it does have its own disadvantages especially when you have to live with it for weeks. The globe sounds interesting but what kind of mold would you use for a circle or then will you be making 2 semi circles and joining them together ? Please share the pictures once you start on your project @! It may turn out to be my next inspiration !! If you would like it, I could always send you mountains and mountains and mountains of our snow – only kidding. I read on line that you can buy old globes they use for lights. The globe you make would be flat on the bottom so it can lay flat on the ground and of course you have to break the glass to get the globe out. I am going to look for some globes in the second hand stores. Your mushrooms are MORE than adorable! You did such a great job! Did you think that up all by yourself I think I want some!!! Thank you for visiting me and your lovely comment Crystelle. After all those goof ups, I think, they turned out okay for a first timer !! 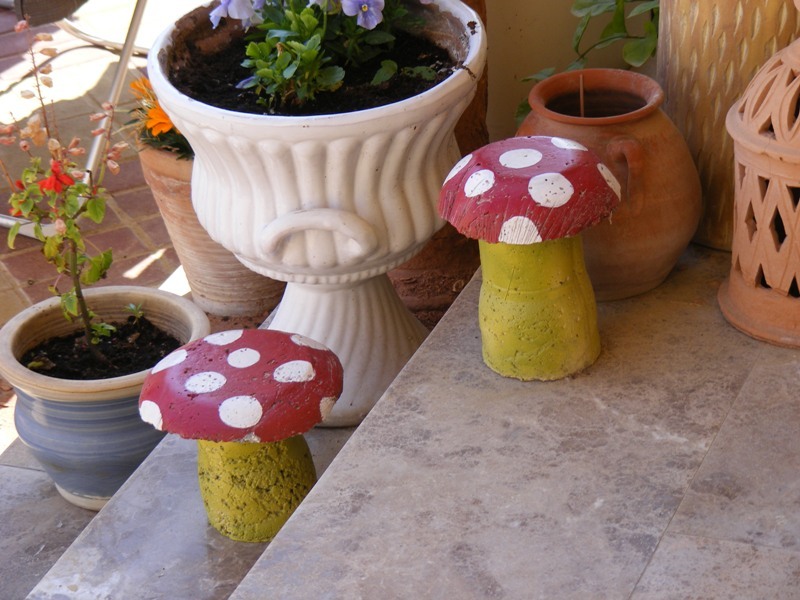 In this case, I had no inspirations to follow, just wanted bright, something red and mushroom-like to liven up my porch. 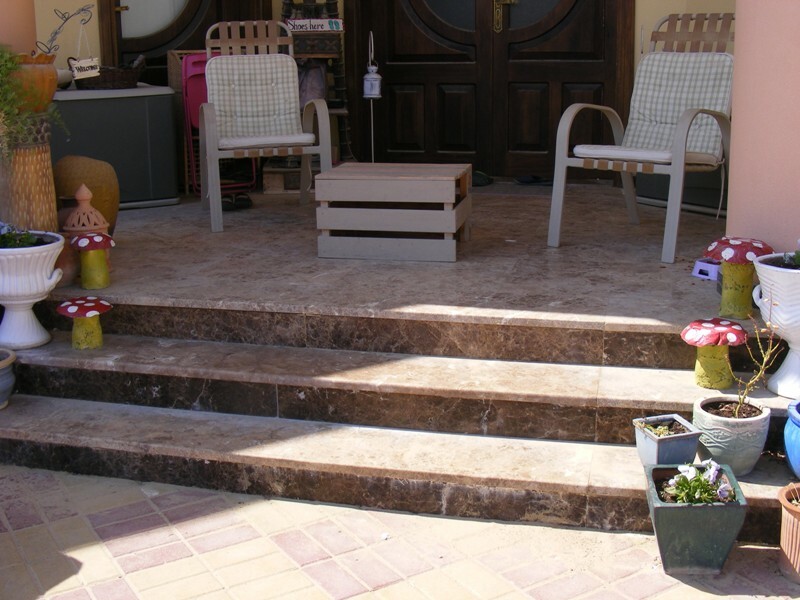 Sadly, it is a very practical and functional porch instead of a stylish one. How whimsical and sweet! It looks like your wing men had fun participating too! 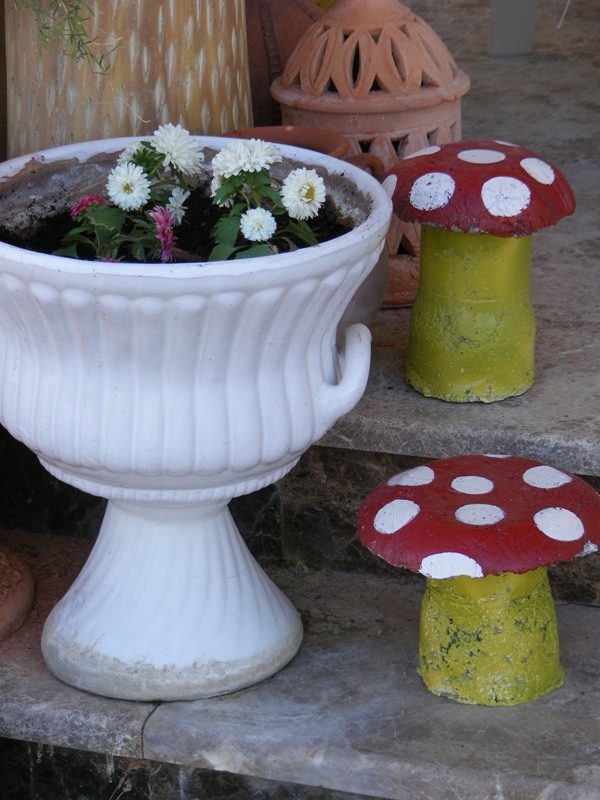 Such a cute idea and great way to add some whimsy to the yard. Very helpful and informative tutorial! 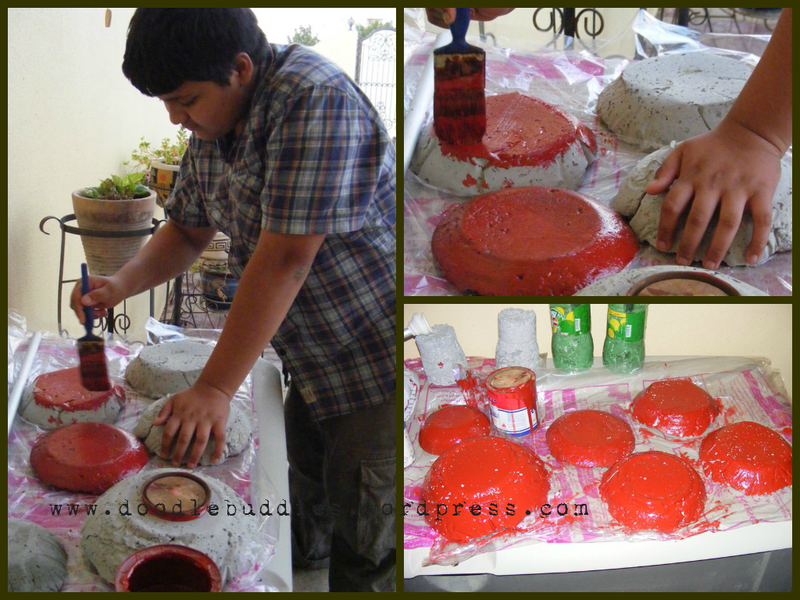 I used cement for the first time last summer, making stepping stones with my grandson’s footprints in them. There definitely is a learning curve! Hi Lisa. Thank you for visiting me. Wow, I think, making a footprint imprint on cement seems like an excellent idea. Maybe even I will give it a go ! How very cleaver and creative! These are super cute! Thanks for your sweet comment on my blog, and for following! i am following you back! What a cute idea!! 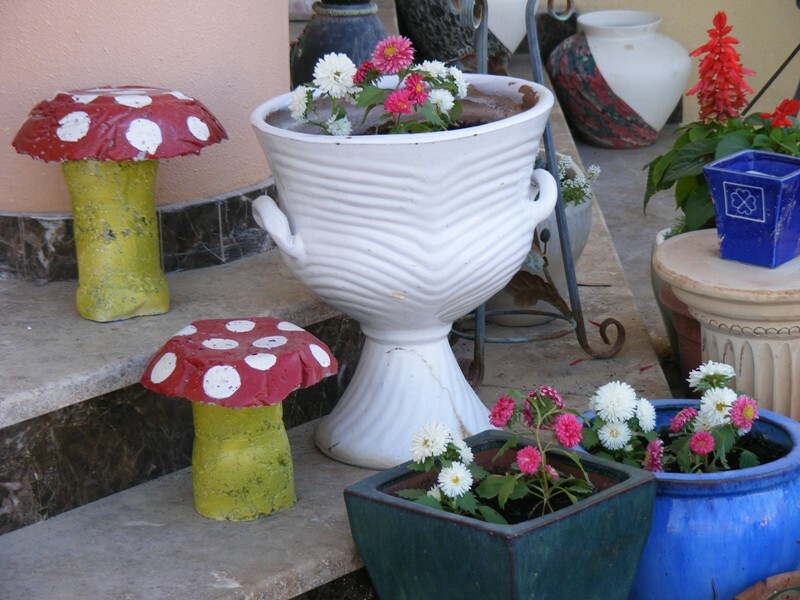 I have never made any of these, but your tutorial is fantastic and I may have to try a couple for the yard this summer! Super, super cute!! Happy Vintage Thingie Thursday! Hi Naush! I am so happy to have found your blog through a wiggly path of following links. 🙂 I believe I came here from Beyond The Picket Fence. I adore your mushrooms, your great tutorial, and especially the goofs you so kindly share. Lol! 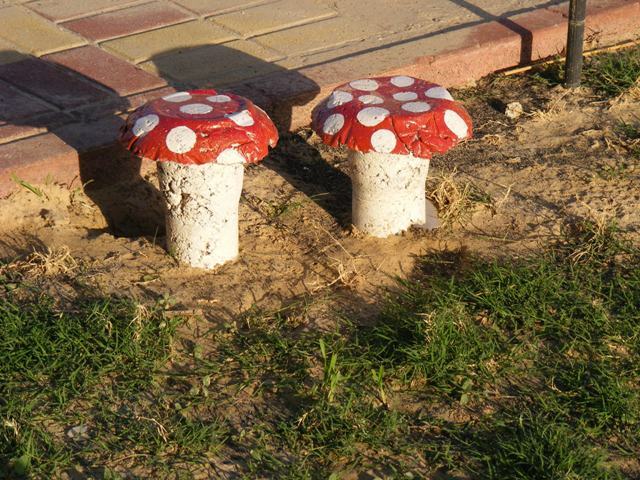 I have been wanting to do a mushroom project in my yard, too, but never would have thought of cement. Love it!! So glad you’re inspired to try it out Marilyn ! Thanks for linking up with us as Flashback Friday. These are adorable! What a fun project! I saw your post on A Vision to Remember’s Check Me Out Saturdays Link up! Thank you popping over Kate. These are soo CUTE!! Thanks for sharing these on DIY Sunday Showcase!! I’m pinning this to our talent board!! Thank you very much Shelly ! How clever and cute! You could use spray foam (great stuff) rather than concrete for light weight party decorations. Wow !! Thanks Toozesty. Good option – will keep it in mind. These are so clever and cute! Thanks for sharing at TTF! WOW WEE !!!! Super excieted !! This is a cute idea! Hope you’ll link up with the Homemaking Party and share your tutorial with my readers! I will feature these tomorrow at Home Sweet Home! Thanks for joining me. Thank you very much for the feature ~ so appreciate it !! omg !! so honored to be featured. Thank you so much. Super cute! Knowing that everything didn’t go perfectly helps as projects like intimidate me a bit, but seeing how you worked through it and the fantastic results is inspiring and I think I am going to have to try this with the weather gets nicer here. Wow kmom !! 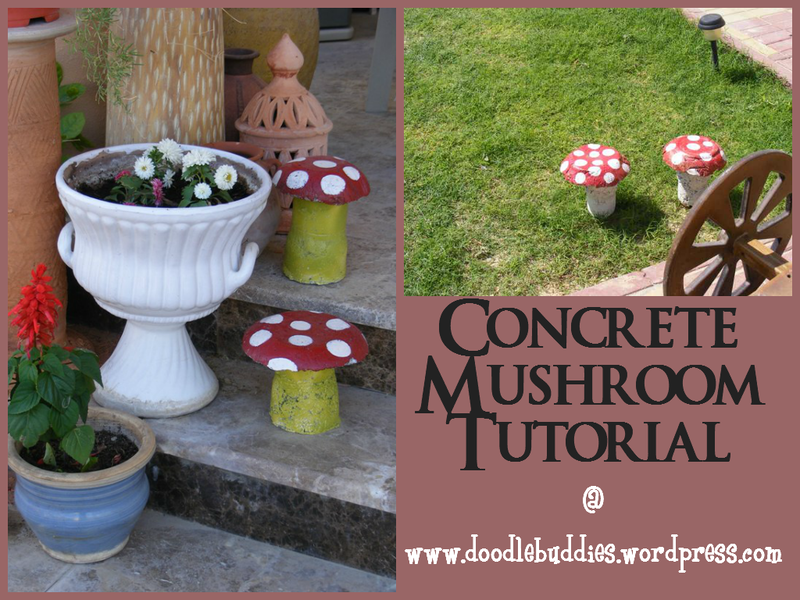 I am super excited that you’d want to give the concrete mushrooms a go ! Please post pics and link it to me too 🙂 I always tell my boys that there are only two things to worry about when we attempt any project ~ what we learnt from the experience and also that we got out of our comfort zone and tried something new that excited us. The end result is not the most important thing coz if we learnt something from the process, we can always attempt again and perfect our flaws. Many regards to you kmom.